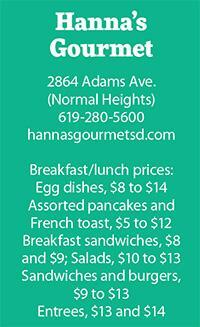 Hanna’s Gourmet ranks among the many places throughout Uptown that attracts lines on weekend mornings. What is different, however, is that diners aren’t flocking to this attractive little restaurant entirely for plain ol’ bacon and eggs or standard buttermilk pancakes, even though such options are readily available. Instead, most come knocking to embark on culinary journeys around the world, which is something few other restaurants can pull off without flubbing in their high ambitions. Chef-owner Hanna Tesfamichael is the talented force behind a concept that spotlights dishes from a different country each week during dinnertime, Wednesdays through Sundays. Though on weekends, from 8 a.m. to 3 p.m., an established menu of unique morning fare can take you from East Africa to Morocco and on to Italy, France, Mexico and other places, depending what you choose. Tesfamichael delved into cooking while growing up in the East African country of Eritrea, which is considered a crossroads for some of the world’s best spices. She studied food and nutrition at San Diego State University, and later worked as a nutrition counselor for Jenny Craig. 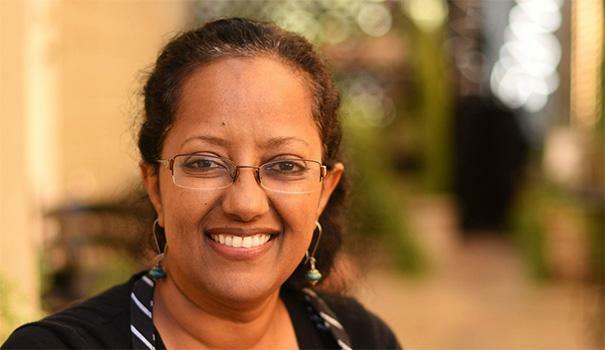 Also an avid reader and collector of cookbooks, she had mastered cooking dishes from 40 countries for her “world tour” menus only a year after opening the Hanna’s Gourmet in 2011. I was there for some of them and never forgot the depth of flavors in her Ethiopian-inspired black bean soup or the sweet, charry essence that sprang from an entree of Afghanistan-style lamb skewers served over cherry-accented rice. In my maiden visit for breakfast recently, I ended up in Spain with a layered dish of over-medium eggs, sliced potatoes, wilted onions, manchego cheese, and bright romesco sauce made with pulverized hazelnuts and pureed red bell peppers. 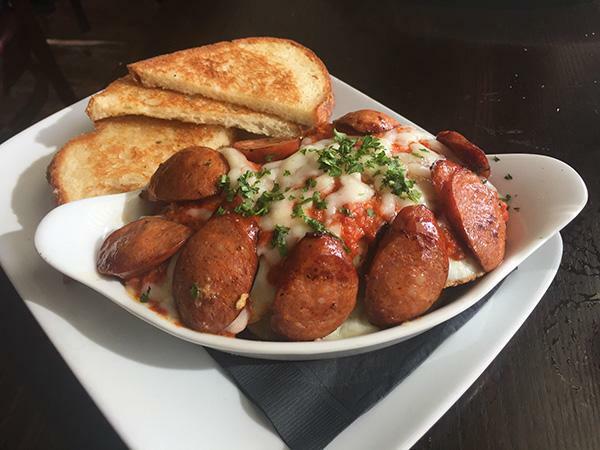 Around the perimeter were coins of Spanish chorizo, which kind of tasted like Polish sausage with a spicy kick. Nonetheless, the dish was firmly rooted in Spain — if not Catalonia to be exact, given its hearty nature. 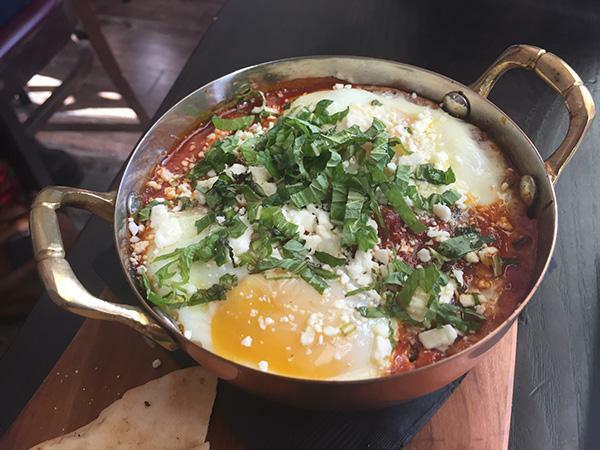 My companion took the road to Marrakesh with exotically spiced ground lamb mingling with baked eggs, tomato-pepper sauce, feta cheese and fresh mint. The combined ingredients offered a fantastic corsage of flavors you’d be more apt to encounter at dinner rather than breakfast. But who cares? After years of eating pretty much the same thing for breakfast, it’s fun taking the ritual to a faraway land. On this slammed morning, when every table inside and outside stayed occupied, our egg dishes arrived about 30 minutes apart. But we filled the lapse with an item from the lunch menu, a Caesar salad served in a Parmesan bowl. Yes, it’s safe to eat romaine lettuce now, and by all means do it here because that curvaceous piece of fried cheese you get with the salad adds a tangy, mouthwatering thrill. 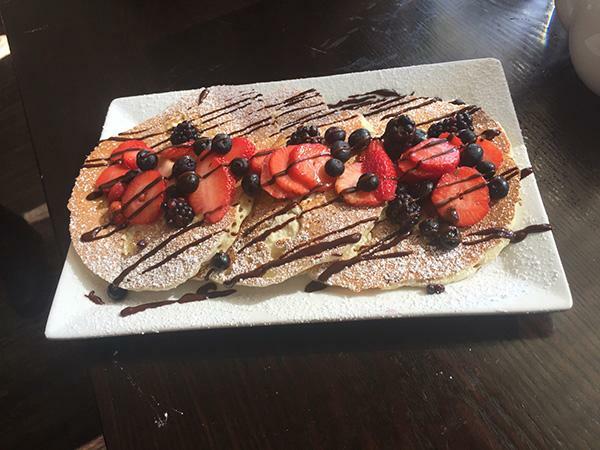 As a dessert course, we ordered the berry-ricotta pancakes flaunting swizzles of dark chocolate. Apply a little maple syrup to them, and the embedded ricotta and fresh berries on top come alive with the kind of juicy, sinful sweetness more common to gourmet confections. And “gourmet” is the key word here. Tesfamichael bestows its meaning to every dish that leaves the kitchen, whether it’s through her keen use of spices, complex sauces or remarkable balances of textures. For an unassuming neighborhood restaurant, the meals are surprisingly top quality and always engaging. Coming up next for the restaurant’s weekly world tours are dishes from the Philippines followed by those from Austria. In addition, Tesfamichael is holding a family-style Peruvian dinner on Jan. 17 at 5:30 and 7:30 p.m. for $40 per person.